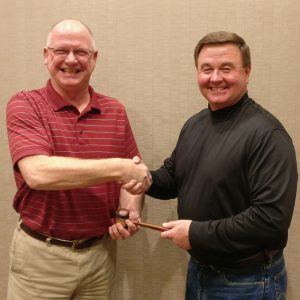 At its annual spring meeting, the Southeastern Chapter installed our new officers for the 2018-2019 membership year: Chapter President Bobby Powell and Vice President Billy Johns. Chapter Secretary-Treasurer Peggy Hunnicutt has agreed to serve one more year in this capacity in order to groom new directors for the chairs. 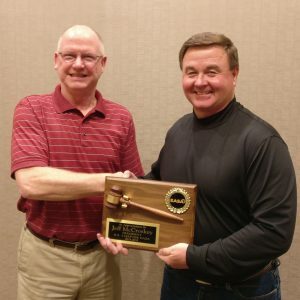 Outgoing president Jeff McCroskey passed the gavel to incoming president Bobby Powell of Holland Industrial. 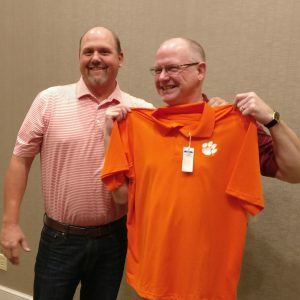 President Bobby Powell congratulates Jeff on a job well done and presents a token of the chapter’s appreciation. 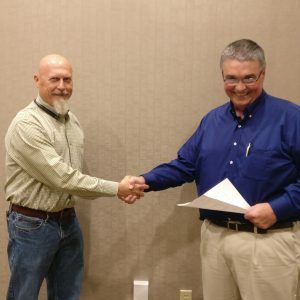 Region II Director Charlie Brown congratulates incoming Vice President Billy Johns of Stewart’s Electric Motor Works on taking office. Director-At-Large Brian Cothran presents Jeff with a shirt commemorating the results of a recent basketball game.